The final round of LG’s inaugural ‘Conceptualife Competition,’ held at Zayed University Auditorium, Dubai, drew to an exciting finish with 12 contestants from the UAE, Saudi Arabia, South Africa, Turkey and Iran, who presented their vision for the future of kitchen design and appliances., the participants were required to present their designs to a panel of four judges and explain their creative thought process and vision for the kitchen. 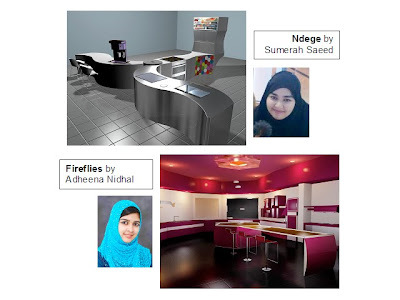 Sumerah Saeed and Adheena Nidhal were two of the twelve finalists representing UAE from the Interior Design Department of Manipal University, Dubai. There were a total of four participants who made it to the semi-finals out of 35 entries from Manipal University - Farha Esmail, Radhika Bajaria, Adheena Nidhal and Sumerah Saeed. The following were the finalists selected from their respected universities to present in the competition. Contestants were judged according to five main pillars; uniqueness of design in terms of layout and individuality from current kitchen designs available; use of innovative kitchen appliances, their features and functionality; use of space, storage, areas and worktops; environmental solutions including the use of recycled material and durability and finally; practicality of the overall design. Ali Kajuee (Iran) was selected as the winner for his design, titled ‘Ecoquina’ which showcased both a fusion of Eastern and Western cultures and eco-friendly ideas. Kajuee took home a prize of $5,000. Aya Abdullah Jibreal (KSA) came 2nd for her unique design ‘Nucleus’ receiving a cash prize of $3,000, whilst Maroaan Gelderblom”(SA) was the 3rd receiving a total of $2,000. The concept of Adheena Nidhal's kitchen was based on floating objects and shape changing cupboards, titled "fireflies", whereas, Sumerah Saeed's design titled "Ndege" was designed as a completely transportable and high- tech kitchen. LG’s ‘Conceptualife Competition’ was established to provide young, upcoming designers with a forum through which they could unleash their creativity and showcase the future of kitchen design and appliances. Drawing hundreds of entries from across the region, the finale saw submissions narrowed to the top 12 entries. The talent gathered at the finale was truly inspirational. Each of final contestants demonstrated a unique fair for design, with innovation at the heart of their creations. IS it possible to see more of the deign talent submitted for this competition? It would be nice to see the presentaitons of the 1st, 2nd and 3rd place winners. Can anyone help me find out where I can go to see? We don't have the presentations of the winners you have to contact LG or the participants for their work!